Greens. We either love them or we don’t. At least, that is my unscientific observation at the mere mention of this word in the culinary world. I love them—some more than others. Often seen as the quintessential southern dish, greens are eaten, well…all over the world. Perhaps it’s because they are inexpensive and nutrient rich or maybe because they are quite abundant. And by greens, I mean all greens…collards, spinach, kale, Swiss shard, turnip, mustard, beet, sweet potato, and more. I am sure I have missed a few exotic ones, but suffice it to say, there are a lot of greens out there. Kale and spinach have enjoyed ego boosts lately due to the health craze of green smoothies and juicing; however, I would venture to guess that the consumption of all greens has increased. Let’s face it, greens are good for us. When thoughtfully prepared, they taste good, too. In an age of the awareness of mounting food waste and farmers markets where we can get beautiful produce with the greens still attached, greens are getting a second look from chefs and consumers alike. Stewed, sautéed, flash-fried, puréed, or chopped raw in a salad—any way you eat them, greens can be a flavorful dish. The key is picking the best greens for the recipe. Some greens are best stewed for a good amount of time with seasonings that compliment their earthiness and a cooking time that makes them tender (collards, mustard greens, turnip greens). Others can be enjoyed raw or lightly sautéed (kale, spinach, Swiss chard). I have even had them fried. On that note…if you ever visit Chef Vivian Howard’s restaurant in Kinston, NC, Chef and the Farmer, you MUST order the fried collards. They will blow your mind. My favorite “go to” recipe for a quick side dish of healthy greens, is to sauté them in olive oil with sliced garlic. If you like a little heat, add red pepper flakes to the oil before sautéing. This recipe can be done with kale, spinach, beet greens, or Swiss chard. It is delicious on its own or you can use it as an ingredient in the recipe below. It’s perfect for breakfast or a light lunch. The addition of Two Chicks Farm Spicy Red Pepper Jelly was my attempt to use this tasty ingredient in more recipes. 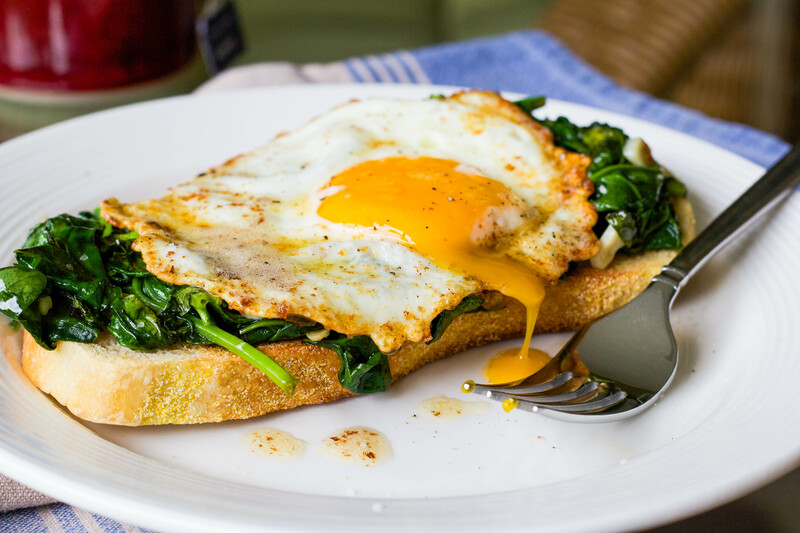 And, as we all know…everything is better with a fried egg on it! The beautiful greens pictured here were from Colorfield Farms. You can visit them at the Western Wake Farmers Market every Saturday! Heat about 3 tbs. of olive oil in a skillet over medium heat. Add, garlic and sauté for about 2 minutes. Add greens and sauté for about 4-5 minutes or until wilted. Remove from heat and add 1-2 tbs. red pepper jelly, salt, and pepper. Evenly divide the greens over two pieces of toasted bread. 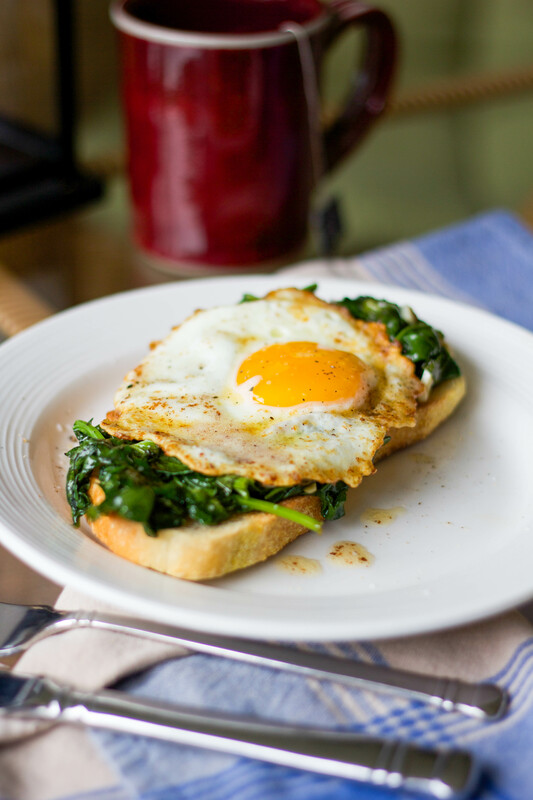 Top each with a fried egg—I use a little butter and some olive oil to fry my eggs. Salt and pepper to taste. Want more info on the various types of greens and what to do with them? Visit The Science of Eating.